A few posts ago, okay maybe more than a few, we made pretzels. For these pretzels, we had to purchase bread flour. So when you have bread flour, you make bread. We have never made bread before and have only used yeast once before on the pretzels. Our family friend almost always brings this excellent dill dip and bread at family functions. So we picked a recipe for soft white bread and made dill dip too. The bread recipe can be found here and the dill dip can be found here. With this recipe, there are only a few a ingredients but it calls for patience and lots of it. The dough is kneaded for 8 to 10 minutes, which is an arm workout too. Then it needs to rise to double its size after it is mixed (about 20 mins) and again after it is put in the pan before it is baked (about 20 mins again). We didn't measure if it was exactly double in size but we when you can say "wow that is bigger," it' a good indicator. If you need something to entertain you while you wait, this is what we have been laughing about of late. Yeast rises best in 80 - 85 degrees. To get this temperature, cooks illustrated recommends heating the oven to 200 degrees for ten minutes and then turn it off and put your dough in the oven in a non metallic bowl. We baked the bread for 40 mins according to the recipe said but didn't keep as close of an eye on it like we should so our bread came out a little bit burned on the edges. We would recommend to start checking your bread at 30 mins or so and when the bread becomes brown, take it out. The smell of baking bread is soooo good. It is smells like down home goodness. I am not sure that makes sense but you bake it and let us know what you think it smells like. Lessons learned: Don't get too involved watching "Justified" and think that your bread isn't going to burn. 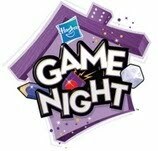 Sara and I were lucky enough to host a Hasbro Game night through a website called House Party. We signed up and they sent us the new edition of Trivial Pursuit before it's available in stores. They also sent Taboo, Electronic catch phrase and a whole bunch of crackers. We were most excited about the TP game called Trivial Pursuit: Bet You Know It. What's neat about this game is that you can bet on the other players, whether they'll get it right or wrong. Then, you can use those points to buy a piece of the pie or help you in the final round. It makes it a lot of fun. This is where we got the inspiration for this week's baking project. Hasbro calls it a wedge, we (and everyone else we know) calls it a piece of the pie. So, we made pie. This time it's cherry pie. We couldn't decide which kind to make though. The latest issue of cook's illustrated has a recipe for Sweet Cherry Pie (WARNING: you may get that Poison song stuck in your head) but we also had 2 jars of Morello Cherries which we understand can be hard to find but are the best for making Traditional Cherry Pie. So, we made both. We wanted to try the Cook's Illustrated Pie crust recipe because it had vodka in it and we found that interesting. We don't think we'll ever make it again though because it was a real pain. Make the dough, refrigerate it, put it in the pie tins, refrigerate it, put the filling in, freeze it, then finally bake it. It was good but we wouldn't say that it was worth all the extra effort. The filling however was a different matter. It came out quite thick and appealing. We used thawed frozen sweet cherries. CI had a specific brand in mind but we only found one kind at the store and this wasn't it. They were just fine. Their recipe also called for a little bit of bourbon and that was exciting as well. Both fillings called for tapioca but CI's was ground first...don't know what difference it makes. They also use food coloring but we didn't see the point. Mix it all together and it's done. This is very simple but as you can see from the picture, it's also very juicy. We found it a bit worrisome. You can see that the Food Network pie is overflowing with juices but the Cook's Illustrated pie is perfectly set. We would have to see if they survive the oven but first decorations! We took leftover pie crust dough and dyed it to correspond with the wedge pieces in the new trivial pursuit game. The plan was to lay it over the crust as big pie pieces but the dough wasn't cooperating after being handled so much in the dyeing process so we scaled it down to game piece size. We we proud of our artwork so into the heat they went. Sweet Cherry Pie came out perfect as expected. The Classic Cherry survived as well. Everyone at the party had small pieces of both to tell us which they liked the best. We were a bit surprised by the results. It seems that although the sweet cherry filling was appreciated, it was unexpected. It seems that out board gamers were more accustomed to the classic cherry flavor and happy to have enjoyed a pie that was of quality and that they were used to. We'd make it again. Lessons learned: You shouldn't mess with the classics. Also, if your oven is enough for 2 pies, but your baking sheet (to catch the drippings) isn't, try 2 baking sheets. Otherwise you may end up like a mess like us. Our cousin Bryan and his wife Katie welcomed a new member of the family last week. Oliver was born on June 2nd and to celebrate, we made Carrot Cake cupcakes. Now, how does that relate you might ask. Well, these baby carrot cakes were made with carrot baby food. This is a technique that we've been wanting to try and the arrival of Oliver was a perfect opportunity. Katie has been an avid supporter of this blog so we dedicate this post to her and her new family. Preheat to 350. Put your cupcake papers in the tins. Combine the sugars and oil in a large bowl and beat well. Add the eggs, baby food and vanilla. Beat until smooth. In a separate bowl, combine the sifted flour, salt, baking soda and the spices. Enjoy the smell. Combine it all together and beat well. Fill the papers 3/4 full. We found that this recipe makes 20 cupcakes so we had 4 empty spots. We put a little water in these to make sure the pan didn't warp. It's not likely that it will but we wanted to be safe. Speaking of which, we only advise doing this if you are extra careful not to get the hot water spilled onto you or your freshly baked goodies. 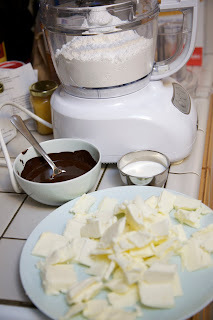 Beat the cream cheese and butter in a mixer till fluffy. Add the vanilla and sugar leave the mixer running till smooth. Even though these are made with baby food, Oliver obviously can't eat them yet. And I know some people are turned off by the idea of baby food in adult food but the ingredients in the baby food are carrots and water. Nothing else and nothing to worry about baking with. We wanted to make them into cupcakes because #1 Katie loves cupcakes, and #2 we thought they would be easier to ship. Katie and Bryan live in the Bay Area and we are in Los Angeles. We won't get to see them till next month and that's just too long. It just is. We found these little boxes to help us get the cakes to them. They're called Cup-a-Cake and you can get them here. We froze the cupcakes Wednesday night and then overnighted them the next day. They should be getting them today. We hope they enjoy them and welcome Oliver! Lessons learned: Hopefully shipping works... We will add shredded carrots to the batter next time. The flavor is good but could be more carrot-y. Sorry, this is late. Haven't had much time to write up the post but here it is now. Enjoy! Ellen is our sister and Monday was her 2 year Wedding Anniversary. Their wedding was a great event and all of the planning and preparations went smoothly except for one thing... the cake. 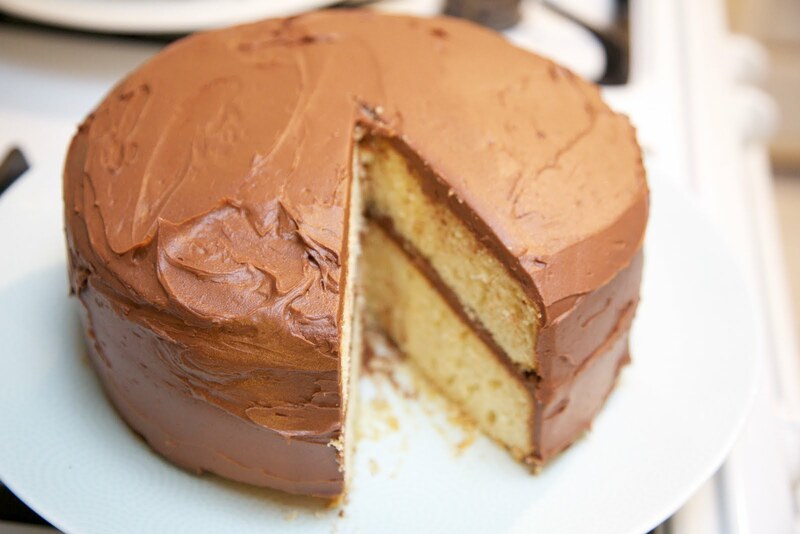 Ellen and Brandon decided that their favorite cake is Yellow cake with chocolate frosting. Simple. Classic. Tasty. Erin insists that this is birthday cake but what you want on your wedding day is what you should get. You would think that this is a very easy thing to find at a bakery but you would be wrong just like we were. We went to over a half dozen bakeries around the Los Angeles area and they all felt that Yellow Cake and White Cake or Vanilla cake was the same thing. After hearing this a lot, we decided that maybe we didn't know something that they did so we scheduled a few tastings or should we say disappointments. Listen up bakeries; the customer is always right. First off a yellow cake should at least be yellow. Its just sad knowing that what you're about to taste and waste calories on is just not what you're looking for. Second, what makes the cake yellow is not food coloring, its egg yolk. 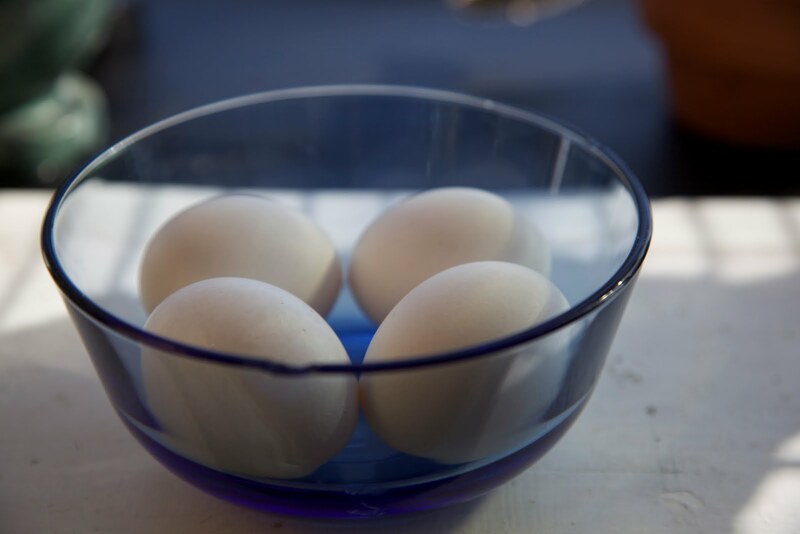 Yolk that adds the richness of flavor and that density that when combined with the sweet vanilla flavor brings you back to your childhood. Is that too much to ask? We eventually did find a great bakery: Ms. Ruby's Bakery in Inglewood. She apparently specializes in Red Velvet Cake and Fried Chicken but her Yellow Cake is also amazing and the prices were VERY reasonable. Flash forward 2 years and we're on a Yellow Cake mission again, this time to make it ourselves. We found a great recipe at Smitten Kitchen. Erin would like it noted that Deb at Smitten Kitchen thinks this is birthday cake too but here we turn it into... Anniversary Cake, ta da! 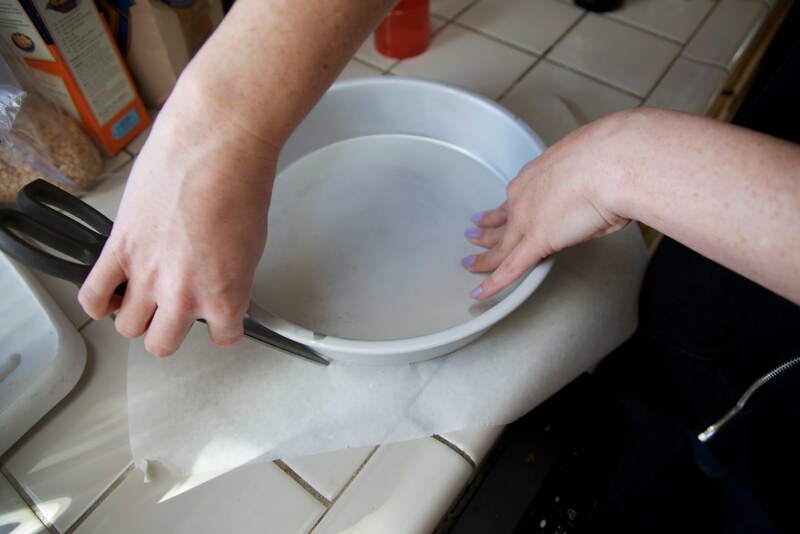 We really liked the use of parchment paper and greasing the pans with Baking Pam. That stuff smells soo good! We are big fans of this frosting because it's so easy. You put all the ingredients in the food processor and you're done. It's very cool. These recipes can be found at the link above for Smitten Kitchen. 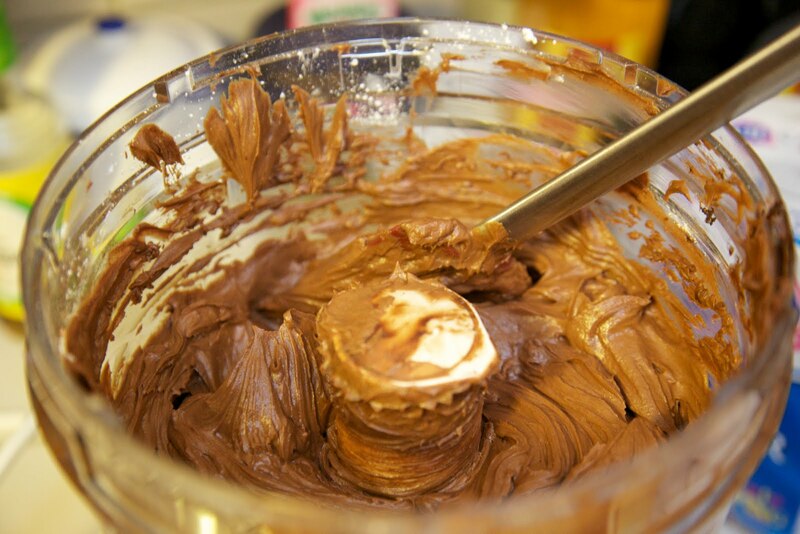 The frosting is the Instant Fudge Frosting. The cake and the frosting taste great with a glass of milk.